Today our Sr. Maria Agnes of the Good Shepherd celebrated 50 years of religious profession! Congratulations, dear Sister! There were no special celebrations today as the Mass of Thanksgiving and celebration will take place next month. However, we did celebrate by having ice cream at dinner! 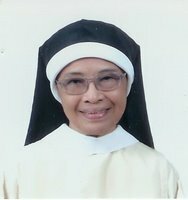 Sr. Maria Agnes became a Catholic while a student at Santo Tomas University in Manila on December 3, 1953. She entered the Dominican Sisters of St. Catherine of Siena, Philippines on November 28, 1954. She received the habit in 1955 and made profession July 15, 1956. Sister is an accomplished pianist and taught music in several of the Congregations schools and colleges. She also taught religion, spanish, College Theology and was a vice-superior and twice was a delegate to the General Chapters of her congregation. 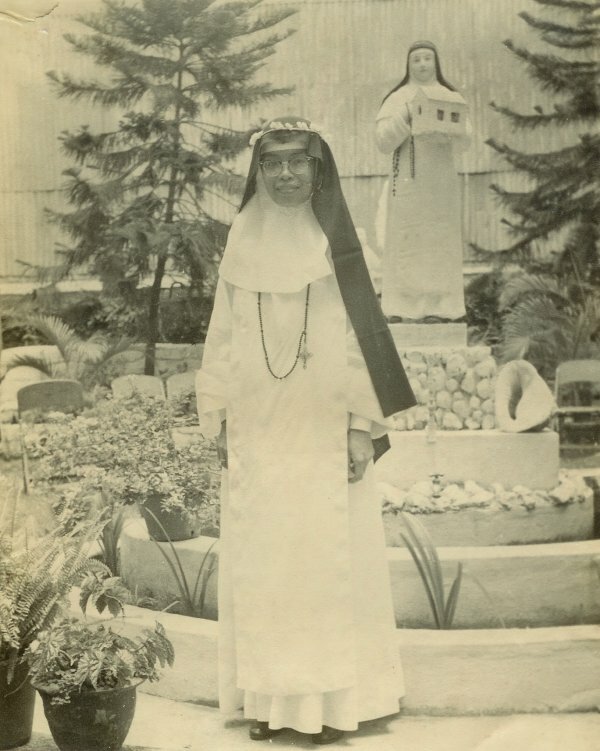 But Sr. Maria Agnes longed for something else--the contemplative life--but there was no Dominican monastery of Nuns in the Philippines at that time. Finally, on August 4, 1973 she arrived in Summit, transferring to our monastery specifically to become one of the group of transfer Sisters who would be the foundress of the Monastery of Our Lady of the Rosary, Cainta Rizal, Philippines. Sr. Maria Agnes made Solemn Profession on March 19, 1977. On August 4, 1977, Sr. Maria Agnes, along with 3 other Filipina nuns and Mother Marie Rosaria returned to the Philippines to begin their new monastery. However, in 1980 Sister returned to Summit never realizing that almost 25 years later she would be called upon to serve the Cainta monastery as Prioress. Now, 3 years later Sister is once more home and she hopes for good but one never knows what the plan of God is! Sr. Maria Agnes has served our community in so many ways. She has filled our house with music, both at the piano and as organist for Mass and Office. Sister's talent for organization was channeled into putting our entire library (which is huge!) on computer and later in bringing our archives from chaos into order. Sister has been our faithful "kitchenette sister" for many years ("too many!" she says.) and has kept us all clothed while in the tunicelle and habit departments. For years she also kept our tiny gift shop supplied with beautiful rosaries and rosary cases. Sr. Maria Agnes is also an expert on the Rule of St. Augustine and hopefully, this fall, our novitiate sisters will drink of her wisdom! Sister posted the following poem on our bulletin board, expressing what being a Dominican Nun means to her. We hope you enjoy it as much as we do! Ad Multos Anos, Sr. Maria Agnes! with the God of her heart. for the God of her heart. May not be copied in any form (including blogs)without permission.